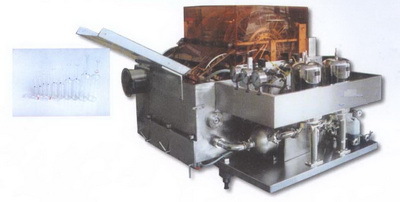 This cleaning machine is used to clean ampoules as well as oral liquid vials. It is of horizontal type a rotor structure, and incorporates ultrasonic cleaning technique with the cleaning method of jetting high-pressure water and airflow. The cleaning effect is excellent. The machine is in conformity with the GMP standards, and it can not only operate independently, but also operate jointly with sterilizing and drying machine and ampoule filling and sealing machine to from a compact line.